For many, the Muslim world in the medieval period (900-1300) means the crusades. While this era was marked, in part, by military struggle, it is also overwhelmingly a period of peaceable exchanges of goods and ideas between West and East. Both the Christian and Islamic civilizations underwent great transformations and internal struggles during these years. In the Islamic world, dynasties fractured and began to develop distinctive styles of art. For the first time, disparate Islamic states existed at the same time. And although the Abbasid caliphate did not fully dissolve until 1258, other dynasties began to form, even before its end. 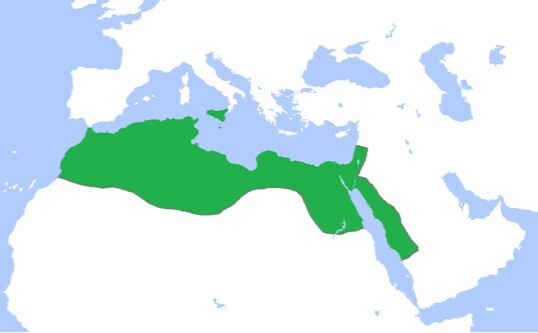 In the tenth century, the Fatimid dynasty emerged and posed a threat to the rule of the Abbasids. The Fatimid rulers, part of the Shi’ia faction, took their name from Fatima, Muhammad’s daughter, from whom they claimed to be descended. The Sunnis, on the other hand, had previously pledged their alliance to Mu’awiya, the founder of the Umayyad dynasty. At the height of their power, the Fatimids claimed lands from present-day Algeria to Syria. They conquered Egypt in 969 and founded the city of Cairo as their capital. The Fatimid rulers expanded the power of the caliph and emphasized the importance of palace architecture. Mosques too were commissioned by royalty and every aspect of their decoration was of the highest caliber, from expertly-carved wooden minbars (where the spiritual leader guides prayers inside the mosque) to handcrafted metal lamps. The wealth of the Fatimid court led to a general bourgeoning of the craft trade even outside of the religious context. Centers near Cairo became well known for ceramics, glass, metal, wood, and especially for lucrative textile production. The style of ornament developed as well, and artisans began to experiment with different forms of abstracted vegetal ornament and human figures. This period is often called the Islamic renaissance, for its booming trade in decorative objects as well as the high quality of its artwork. The Saljuq rulers were of Central Asian Turkic origin. 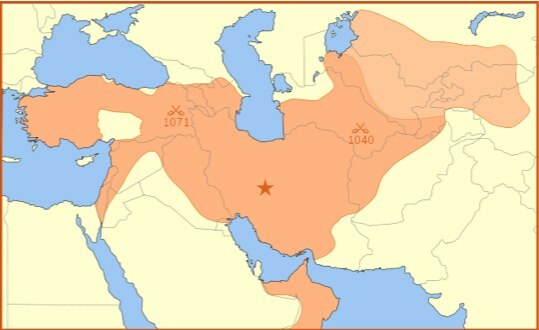 Once they assumed power after 1040, the Seljuqs introduced Islam to places it had not been heretofore. The Seljuqs of Rum (referring to Rome) ruled much of Anatolia, what is now Turkey (between 1040 and 1157), while the Seljuqs of present-day Iran controlled the rest of the empire (from 1081 to 1307). The Saljuqs of Iran were great supporters of education and the arts and they founded a number of important madrasas (schools) during their brief reign. The congregational mosques they erected began using a four-iwan plan: these incorporate four immense doorways (iwans) in the center of each wall of a courtyard. The art of the Anatolian Saljuqs looks quite different, perhaps explaining why it is often labeled as a distinct sultanate. The inhabitants of this newly conquered land in Anatolia included members of various religions (largely Buddhists and Shamen), other heritages, and the Byzantine and Armenian Christian traditions. Saljuq projects often drew from these existing indigenous traditions—just as had been the case with the earliest Islamic buildings. Building materials included stone, brick, and wood, and there existed a widespread representation of animals and figures (some human) that had all but disappeared from architecture elsewhere in Islamic-ruled lands. The craftsmen here made great strides in the area of woodcarving, combining the elaborate scrolling and geometric forms typical of the Arabic aesthetic with wood, a medium indigenous to Turkey (and rarer in the desert climate of the Middle East). The name ‘Mamluk’, like many names, was given by later historians. The word itself means ‘owned’ in Arabic. It refers to the Turkic slaves who served as soldiers for the Ayyubid sultanate before revolting and rising to power. The Mamluks ruled over key lands in the Middle East, including Mecca and Medina. Their capital at Cairo became the artistic and economic center of the Islamic world at this time. 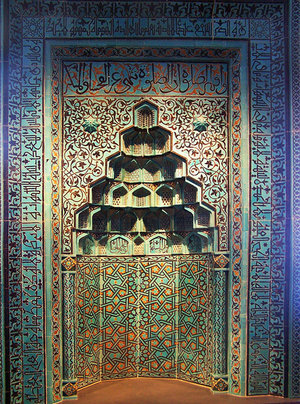 The period saw a great production of art and architecture, particularly those commissioned by the reigning sultans. Patronizing the arts and creating monumental structures was a way for leaders to display their wealth and make their power visible within the landscape of the city. The Mamluks constructed countless mosques, madrasas and mausolea that were lavishly furnished and decorated. Mamluk decorative objects, particularly glasswork, became renowned throughout the Mediterranean. The empire benefitted from the trade of these goods economically and culturally, as Mamluk craftsmen began to incorporate elements gleaned from contact with other groups. 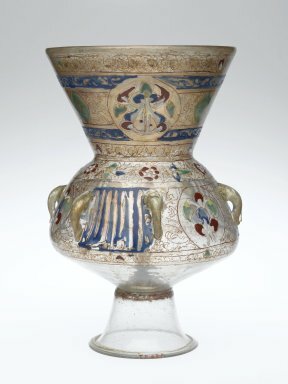 The growing prevalence of trade with China and exposure to Chinese goods, for instance, led to the Mamluk production of blue and white ceramics, an imitation of porcelain typical of the Far East. The Mamluk sultanate was generally prosperous, in part supported by pilgrims to Mecca and Medina as well as a flourishing textile market, but in 1517 the Mamluk sultanate was overtaken and absorbed into the growing Ottoman empire. Cite this page as: Glenna Barlow, "Arts of the Islamic world: The medieval period," in Smarthistory, August 8, 2015, accessed April 21, 2019, https://smarthistory.org/arts-of-the-islamic-world-the-medieval-period/.